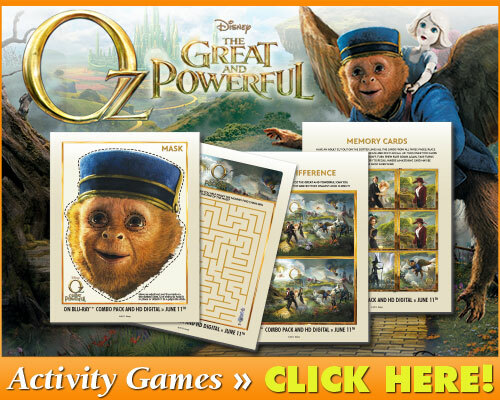 SARAH'S BLOG OF FUN: Oz The Great And Powerful On DVD Tomorrow!! 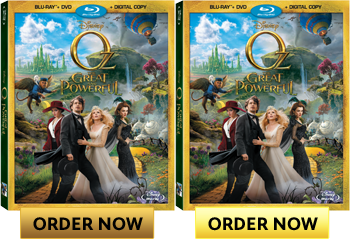 Oz The Great And Powerful On DVD Tomorrow!! 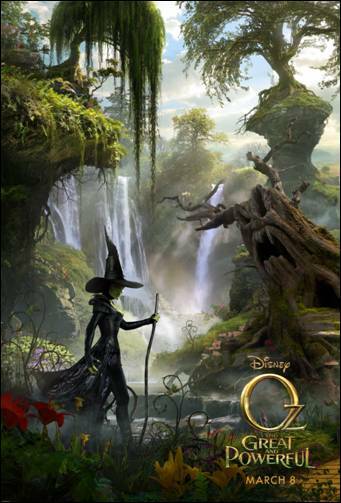 Disney’s fantastical adventure Oz The Great And Powerful uncovers the origins of the beloved wizard character first brought to life in L. Frank Baum’s book The Wonderful Wizard Of Oz. As a cinematic prequel to the book, the eye-popping action follows the story of Oscar Diggs, a small-time circus magician with dubious ethics. When Diggs is hurled away to the vibrant Land of Oz, he thinks he’s hit the jackpot – until he meets three witches, who aren’t convinced he’s the great wizard everyone is expecting. Reluctantly drawn into epic problems facing Oz and its inhabitants, Oscar must find out who is good and who is evil before it’s too late. Sam Raimi is the acclaimed director behind the action-packed spectacle, which boasts a stellar cast including James Franco as Oscar Diggs, the predestined wizard; Mila Kunis as the tormented young witch Theodora; Rachel Weisz as Theodora’s older sister, Evanora, the witch who rules over the Emerald City; and Michelle Williams as Glinda, the good witch. Is it true that you trained with acclaimed Las Vegas magician Lance Burton in order to tackle the role of Oscar Diggs? That’s very true. We shot the movie in Detroit and they hired Lance Burton to come out and train me there. [Oz The Great And Powerful director] Sam Raimi was very insistent that I have two weeks of magic training, so I went to Detroit two weeks early in order to do that. What magic tricks did you learn? Lance taught me a lot of tricks, so I got to the point where I could materialize doves out of nowhere. I start with a flame in my hand and then I turn it into a dove. Or I take off my gloves and I turn them into a dove. I also know a ‘rabbit out of the hat’ trick and other things like that. I did all that work and then the scenes that were going to feature the magic tricks turned out to be too long, so they were quickly cut from the finished movie. We never got to see them on the big screen. Do you know enough tricks to entertain at a children’s birthday party? What does magic mean to you? I wouldn’t say I am the biggest magic enthusiast, but I do enjoy that world. What’s the name of the guy who works with David Mamet? Ricky Jay. I really enjoyed his show, Ricky Jay & His 52 Assistants at the Geffen in Los Angeles. He’s a huge magic scholar. I would say that I definitely like the world of magic, but I am not a magic specialist. What does the fantasy genre mean to you? The first movie that I can remember seeing in theaters was Jim Henson’s The Dark Crystal. I guess I liked it so much that my parents kept taking us back to see it over and over again. I saw it many times in the theater, so that maybe started the ball rolling for me with fantasy. Soon after that, my father read The Hobbit to me, and that was one of the main books that started my love of reading. That’s what got me reading the Oz books of Frank L. Baum, on which this movie is based. If we are talking about fantasy books, those were the two things that really sparked my imagination: the Oz books and the Tolkien books. It all started from there. What is it like to work with Sam Raimi on a project like this? Sam is one of the most fun directors to work with. A director really sets the tone of how people go about things, so when you have someone like Sam involved, everybody is happy. He’s a very collaborative director, not just with the actors but with all departments and it really makes people want to do their best because they all feel like they are a big part of the movie. I love working with Sam. I’d do anything with him. What did you enjoy the most about working with the various witches of Oz: Theodora, played by Mila Kunis; Evanora, played by Rachel Weisz, and Glinda, played by Michelle Williams? It was great because they all played very different witches, so the scenes that I played with all of them were all very different. With Mila’s character, Theodora, I play more of a seducer and charmer. Rachel’s character is trying to dupe me, so I play a little bit more of a fool or a buffoon with her. And then with Michelle’s character, Glinda, it’s more of a straightforward romance. It was nice to have that variety. How would you describe your female co-stars? I got to work with three of the best actresses working today, which was very exciting. They are all very different actresses, and they all played very different parts. But one thing I can say about them all is the fact that they are very good at doing research and background on their characters. I think Michelle read most of the books and did a bunch of research that really manifested itself in her scenes. She was very focused on detail. And with Rachel, we only had one or two scenes together, but she was very good at improvising and looking for alternative takes once we’d got the scripted scene down. What was it like to work with Mila Kunis? Mila is amazing. She’s a very talented actress who is great to work with because she’s so collaborative. She’s very open and she’s very quick on her feet. 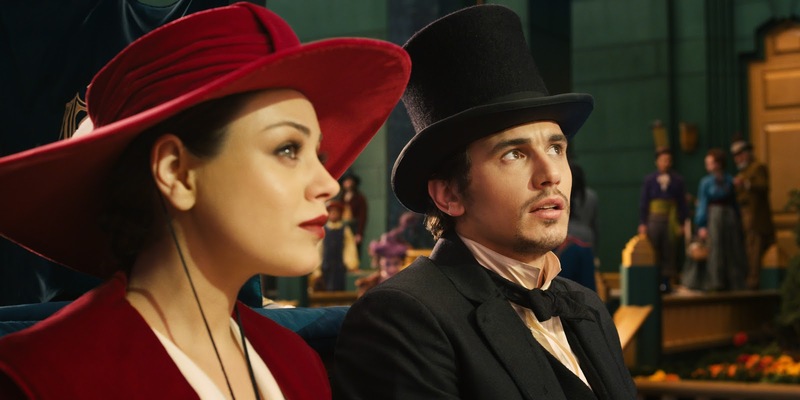 When I first met with [Oz The Great And Powerful producer] Joe Roth and Sam Raimi, they were already talking to Mila – and that was a big plus for me. The sets created for the movie are incredibly impressive, but there was also a lot of blue screen work. Do you prefer to work on movies where you have to use your imagination and blue screen? Or do you prefer the ultra-realistic work of movies like 127 Hours? I don’t prefer one or the other. I don’t think like that. When I look at a new film project, I don’t say, “Oh, I love independent films. That’s the only time I get to do what I truly love.” And I don’t say, “I only want to do big budget films.” I just think about what one wants to achieve with the film. With this film, half of the movie is a fantastical world that needs to be created in a particular way that costs a lot of money, so this movie needed to be made by a big studio. I was really happy and excited to be involved with it. I think it’s great. You’re an actor, a producer, a writer, a director and a teacher… Is there anything left for you to conquer in the entertainment industry?